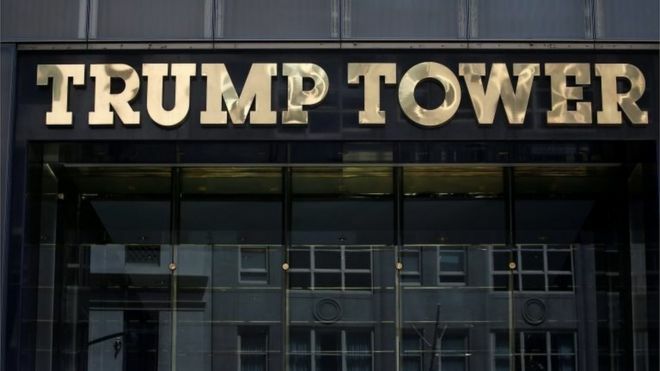 A US Secret Service laptop with Trump Tower floor plans and other sensitive material has been stolen from an agent's vehicle in New York, BBC reports. The laptop was protected by encryption and carried no classified information, the Secret Service said. But the computer does have details on a criminal inquiry into former Democratic candidate Hillary Clinton's use of a private email server, ABC News said. The Secret Service released a statement saying "an employee was the victim of a criminal act in which our Agency issued laptop was stolen". The agency added that its computers "contain multiple layers of security including full disk encryption and are not permitted to contain classified information". ABC said the female agent's vehicle was targeted in the Bath Beach area of Brooklyn on Thursday. CBS News said the computer also carried important files on Pope Francis. A police source told the New York Daily News: "There's data on there that's highly sensitive. They're scrambling like mad." Secret Service "lapel assignment pins" for President Donald Trump, the Clinton campaign and the United Nations General Assembly were also taken with the laptop, according to US media. The items were reportedly stolen from a bag inside a car in the agent's driveway. The bag has since been recovered but the laptop has not, US media reported.